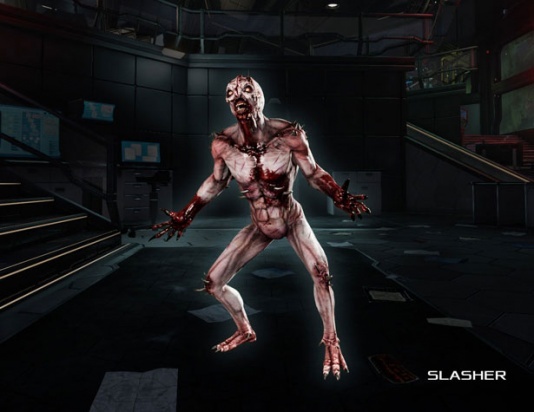 The Slasher is a common specimen in Killing Floor 2. It is classified as a lesser enemy, and therefore, cannon fodder. Although extremely weak on their own, their real strength comes in numbers. 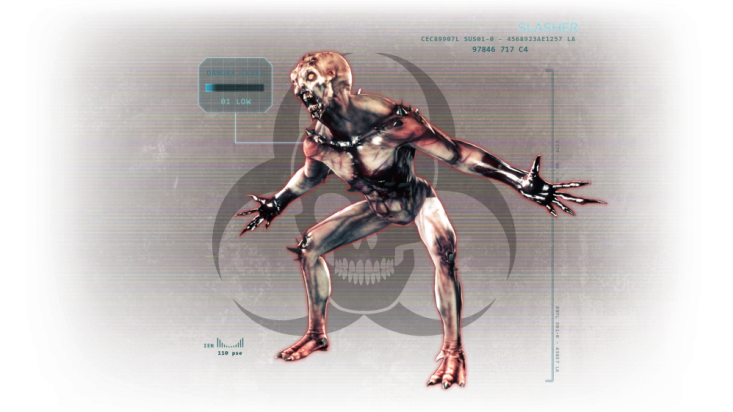 However, Slashers are more agile, aggressive and unpredictable than the other Clot variants. Slashers move slowly when docile, and sprint when enraged. On higher difficulties, Slashers have a chance to enrage upon sighting a Player, and have a chance to enrage when shot. Once enraged, Slashers will never stop sprinting until they are killed. 1 unit = 1 centimeter. Should sprint if can sprint OR (if can sprint when damaged AND damaged) (i.e. if sprint chance met its value). Should sprint when frustrated. Slashers have little to no resistances, and have a crippling weakness. 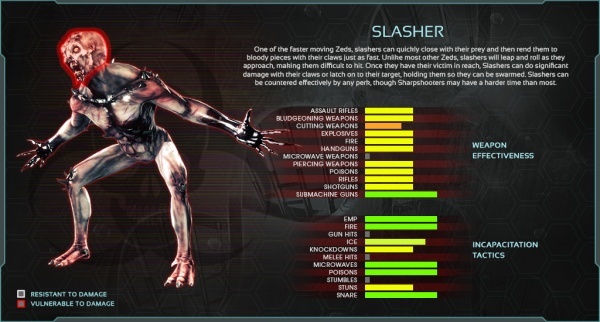 Slashers have no resistances to ballistic weaponry and are extremely vulnerable to sub-machine guns. Slashers only have one weak spot, which is the head. The Slasher is a somewhat predictable, melee-only ZED. Upon spawning, it will walk or sprint towards the nearest player and attempt to scratch them, or grab and bite them, immobilizing their target. 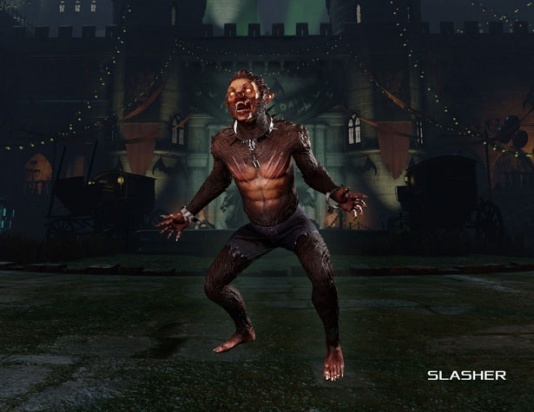 However, Slashers are more aggressive and will more likely spawn enraged than their counterparts. Slashers have the ability to dodge gunfire, and they do so more frequently the higher the difficulty is. They will either leap to the left or the right, or quickly roll towards the offending player. On Suicidal and Hell On Earth, Slashers will always dodge when they are shot. 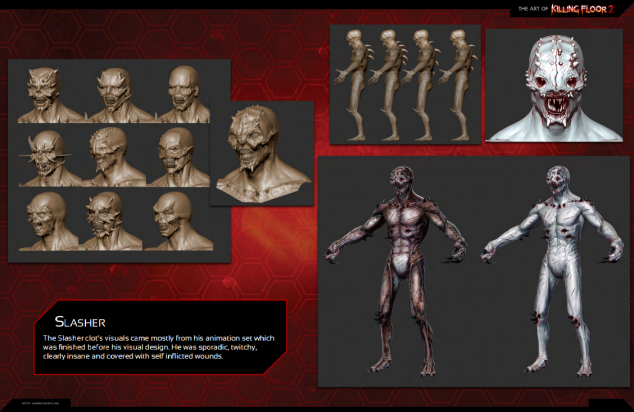 On Suicidal and Hell On Earth, Slashers gain additional attack animations that they will use when they are enraged. They will begin to leap at players and perform combat dodge rolls to close the distance quickly, before slashing furiously with both arms, dealing multiple hits. Slashers become high priority threats at harder difficulties who are capable of closing the distance and outputting an impressive amount of damage quickly. (PvP) Rally boost: forces AI Slashers to sprint, players do x1.2 more damage.. Distance to perform grab = 1.88m. Maximum grab range = 2.1m. Grab attack can be interrupted. Damage to doors (possible values) = 6 / 24. Slasher cannot grab the player for 1 second after grenade throw. Slasher cannot grab the player for 0.5 seconds after shooting the healing dart. This ZED can be knocked down when jumped on. Slasher has a chance to evade upon taking damage. Slasher has a chance to evade certain damage sources. Chance to evade after taking damage: Normal - 0.1, Hard - 0.4, Suicidal - 1, HOE - 1. Health loss percentage to trigger evade: all difficulties - 0.01. Resistance to ZED Time, in PvP game: AI Slashers - 25%, player-controlled Slashers - 75%. Being cannon fodder, just about any form of weaponry will take them out very quickly. Ammunition can be saved in early waves by switching to the knife and cutting their heads off. In later waves, Slashers are there to populate the waves and distract players from larger threats. Try to take them out quickly so you can focus on the real threats sooner. However, on Suicidal and Hell on Earth, one has to respect the damage output of Slashers, especially when they spawn in a huge group of 6 and more, which they often do in later waves. They can quickly surround and tear apart unprepared players and leave them close to death for other Zeds to finish the kill. Extremely weak to Sub-machine guns, making the SWAT the best perk for quickly exterminating huge groups of Slashers. Beware of their grabs, as Slashers can end games by catching the last surviving player off-guard and immobilizing them, giving the larger enemies enough time to catch up and kill them. With their high speed and aggression, they are more likely to do this than the other Clot variants. This page was last edited on 6 February 2019, at 18:47.